A perfect vegetable dish to serve at your next gathering, this simple veggie side dish has it all - tender veggies, a creamy cheddar cheese sauce and toasted nuts. Why wait? Try this Cheesy Brussels Sprouts recipe tonight! Cook Brussels sprouts in saucepan of boiling water 8 to 10 min. or until tender. Meanwhile, melt butter in large saucepan on low heat. Whisk in flour; cook and stir 1 min. Gradually whisk in milk until blended; cook on medium heat 3 to 5 min. or until thickened, whisking constantly. Add cheese; cook and stir 1 min. or until melted. Pour cheese sauce into serving bowl. 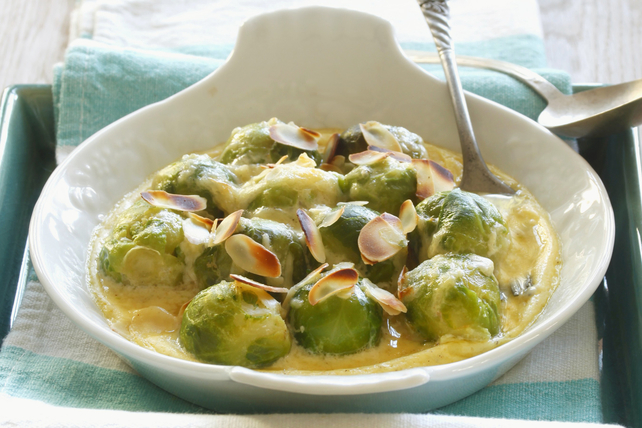 Drain Brussels sprouts; spoon over cheese sauce. Sprinkle with nuts. Substitute cauliflower or broccoli florets for the halved Brussels sprouts.